Jerusalem in 1873, shown in three dimensions. The expansion of Jerusalem in the 19th century, also referred to as the departure from the walls, was the process of building new residences outside of the Old City walls, and shifting the city center to the new neighborhoods. The process started in the mid-19th century and by the early 20th century had entirely transformed the city. Prior to the 19th century, the main built up areas outside the walls were the Mosque of David (today a synagogue) and the village of Silwan. In the mid 19th century, with an area of only one square kilometer, the Old City had become overcrowded and unsanitary, and rental prices were increasingly rising. In the mid-1850s, following the Crimean War, institutions including the Russian Compound, Kerem Avraham, the Schneller Orphanage, Bishop Gobat school and the Mishkenot Sha'ananim, marked the beginning of permanent settlement outside the Jerusalem Old City walls. In 1855, Johann Ludwig Schneller, a Lutheran missionary who came to Jerusalem at the age of 34, bought a plot of land outside the Old City walls when the area was a complete wilderness. He built a house there but was forced to move his family back inside the walls after several attacks by marauders. When the Turks erected outposts along Jaffa Road, between Jerusalem and the port city of Jaffa, and armed guards on horseback patrolled the road, the family returned. The public institutions were followed by the development of two philanthropically supported Jewish neighborhoods, Mishkenot Sha’ananim and Mahane Israel. Mishkenot Sha’ananim (Hebrew: משכנות שאננים‎) was the first Jewish neighborhood built outside the walls of the Old City of Jerusalem, on a hill directly across from Mount Zion. It was built by Sir Moses Montefiore in 1860 as an almshouse, paid for by the estate of a wealthy Jew from New Orleans, Judah Touro. Since it was outside the walls and open to Bedouin raids, pillage and general banditry rampant in the region at the time, the Jews were reluctant to move in, even though the housing was luxurious compared to the derelict and overcrowded houses in the Old City. As an incentive, people were paid to live there, and a wall was built around the compound with a heavy door that was locked at night. The name of the neighborhood was taken from the Book of Isaiah 32:18: "My people will abide in peaceful habitation, in secure dwellings and in quiet resting places." Mahane Israel (Hebrew: מחנה ישראל), built in 1869, was the second Jewish neighborhood built outside the walls of the Old City. Mahane Israel was a "communal neighborhood" and was built by and for Maghreb (western North Africa) Jews. Nahalat Shiv'a was the third residential neighborhood built outside the city walls. It was founded in 1869 as a cooperative effort by seven Jerusalem families who pooled their funds to purchase the land and build homes. Lots were cast and Yosef Rivlin won the right to build the first house in the neighborhood. The neighborhoods that make up the Nachlaot district were established outside the walls in the late 1870s. The first was Mishkenot Yisrael, built in 1875. The name comes from a biblical verse (Numbers 24:5): "How goodly are thy tents, O Jacob/Thy dwellings, O Israel." Mazkeret Moshe was founded by Sir Moses Montefiore in 1882 as an Ashkenazi neighborhood. Ohel Moshe is a Sephardi neighborhood established alongside it. In 1875, Nissan Beck founded the Jewish neighborhood Kirya Ne'emana, popularly known as Batei Nissan Bak ("Nissan Beck Houses"). Beck bought the land and paid for the construction of the neighborhood, opposite the Damascus Gate of the Old City, under the auspices of Kollel Vohlin. The neighborhood was originally intended for Hasidic Jews, but due to lack of financing, only 30 of the planned 60 houses were constructed. The remainder of the land was apportioned to several other groups: Syrian, Iraqi, and Persian Jews. In the 1890s another neighborhood, Eshel Avraham, was erected next to Kirya Ne'emana for Georgian and Caucasian Jews. 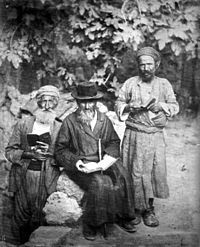 Nahalat Shimon was founded in 1891 by Sephardic and Ashkenazi Jewish Kollels, to house poor Yemenite and Sephardi Jews. The land was purchased in 1890 and the first homes were built soon after, housing 20 impoverished families. The cornerstone of the neighborhood was laid in 1890, near the Tomb of Simeon the Just. ^ Kark, Ruth; Oren-Nordheim, Michal (2001). Jerusalem and Its Environs: Quarters, Neighborhoods, Villages, 1800-1948. Wayne State University Press. pp. 74, table on p.82-86. ISBN 0-8143-2909-8. The beginning of construction outside the Jerusalem Old City in the mid-19th century was linked to the changing relations between the Ottoman government and the European powers. After the Crimean War, various rights and privileges were extended to non-Muslims who now enjoyed greater tolerance and more security of life and property. All of this directly influenced the expansion of Jerusalem beyond the city walls. From the mid-1850s to the early 1860s, several new buildings rose outside the walls, among them the mission house of the English consul, James Finn, in what came to be known as Abraham’s Vineyard (Kerem Avraham), the Protestant school built by Bishop Samuel Gobat on Mount Zion; the Russian Compound; the Mishkenot Sha’ananim houses: and the Schneller Orphanage complex. These complexes were all built by foreigners, with funds from abroad, as semi-autonomous compounds encompassed by walls and with gates that were closed at night. Their appearance was European, and they stood out against the Middle-Eastern-style buildings of Palestine. ^ "Mishkenot Sha'ananim". Jewish Virtual Library. ^ "Jerusalem architectural history". islamic-architecture.info. ^ "Jerusalem Architecture in the late Ottoman Period". Jewish Virtual Library. ^ Eisenberg, Ronald L. (2006). The Streets of Jerusalem: Who, What, why. Devora Publishing. p. 39. ISBN 1932687548. ^ a b Ben-Arieh, Yehoshua (1979). עיר בראי תקופה: ירושלים החדשה בראשיתה [A City Reflected in its Times: New Jerusalem – The Beginnings] (in Hebrew). Jerusalem: Yad Izhak Ben-Zvi Publications. p. 163. ^ Rossoff, Dovid (2001). Where Heaven Touches Earth: Jewish life in Jerusalem from medieval times to the present. Feldheim Publishers. p. 304. ISBN 0-87306-879-3. ^ Ben-Arieh (1979), p. 257. ^ Ben-Arieh (1979), p. 165. ^ "13 New Jewish Homes in Jerusalem - Inside Israel - News - Arutz Sheva". Arutz Sheva. This page was last edited on 2 September 2018, at 07:38 (UTC).